In the Malaysian education system, English has always played an important role. The Malaysian University English Test (MUET) serves to give continued emphasis on this role. The objective of MUET is to measure the English language proficiency of pre-university students for entry into tertiary education. MUET comprises all the four language skills of listening, speaking, reading and writing. It measures and reports candidates’ level of proficiency based upon an aggregated score range of zero to 300. The scores correlate with a banding system ranging from Band 1 to Band 6. A results slip is issued to each candidate who completes all four components of the test. For more information regarding MUET, you may read it here. WHY DO YOU NEED MUET? MUET is compulsory for all STPM (Sijil Tinggi Persekolahan Malaysia) and matriculation students, as well as diploma and pre-university students who wish to pursue a first degree program in local universities. Some first degrees courses in Private College/Universities such as Accounting, would require MUET results as well. There is no entry requirement for MUET. 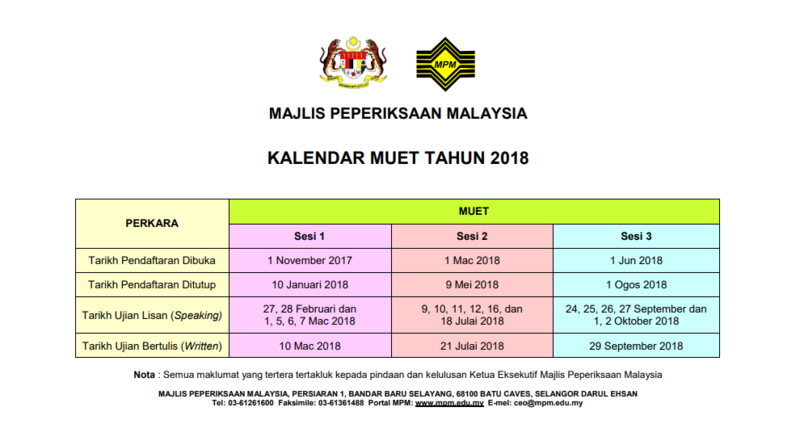 For STPM and matriculation candidates, MUET will automatically be a required subject for all students to take, but it will not be shown in your result slip. There will be a separate result slip for MUET. Registration at IBS College: You may always reach us at IBS College for registration, or call us at 085-438666 for more information. Requirements: Candidates are required to bring along a photocopied IC, SPM results and Registration Forms for registrations. HOW TO REGISTER FOR MUET? Registration for MUET at IBS College: Only Available for Students who registered for Revision Class at IBS College. It is the responsibility of candidates to ensure that their particulars are entered correctly during and after registration made.